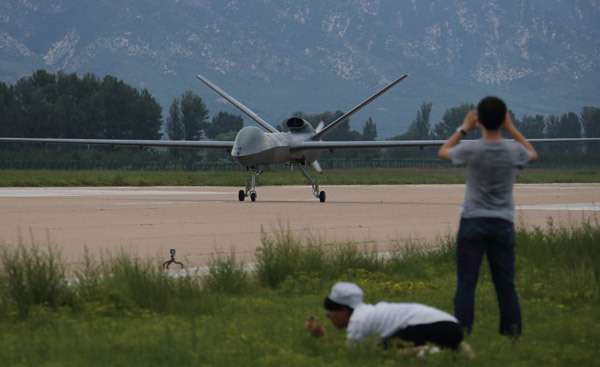 China is ready to mass-produce the CH-5 reconnaissance/combat drone, the nation's latest offering to the international military drone market. The first mass-production CH-5 made its debut flight, in which it was airborne for more than 20 minutes, at an airport in Hebei province on Friday afternoon. Ou Zhongming, project manager of the Caihong, or Rainbow, series of drones at the China Academy of Aerospace Aerodynamics in Beijing, said after the test that several nations, including current users of other CH models and new clients, are in talks with the academy on procurement of the CH-5, which is believed to be one of the best unmanned military aircraft in the world. "Today's flight means the CH-5's design has been finalized and we are ready to mass-produce it," he said, refusing to name potential buyers. The China Academy of Aerospace Aerodynamics is the country's largest military drone exporter by the number of products sold overseas. Its CH-series drones have been sold to militaries in more than 10 countries, making it the largest drone family the country has exported, according to statistics from the academy. Shi Wen, chief designer of the CH series, said the CH-5 outperforms all of its Chinese-made counterparts when it comes to operational endurance and payload capacity. The plane is as good as the US-made General Atomics MQ-9 Reaper, a hunter-killer drone often deemed by Western analysts as the best of its kind, he added. The prototype CH-5 was first flown in August 2015. The drone is made of composite materials and has a wingspan of 21 meters. Twice as big as its predecessors in the CH family, the drone can stay in the air for 60 hours, almost three times that of other Chinese models. Its maximum operational range is designed at 10,000 kilometers, according to Shi. The drone's 1-metric-ton payload capacity enables it to bring as many as 24 missiles on a single mission, strong enough to take out a convoy of armored vehicles. The unmanned aircraft is also able to carry an airborne early warning system to act as a platform for regional surveillance and battlefield command and control. It also can carry electronic warfare instruments to collect electronic intelligence and to jam enemy communications or radar. Moreover, the CH-5 can detect underwater targets such as submarines when mounted with certain devices, Shi said. The CH-5 can also use high-resolution cameras, radar and radio transmitters to serve a wide range of civilian and public sectors.